You’ve done it. You’ve outbid everyone else, and they watch you enviously as you step forward to sign the contract. It didn’t come cheap – you’re paying the man 5 acres of land, enough to sustain a small family forever if they take up agriculture. You smile, wipe the sweat off your brow and sign your name down with a flourish. The man nods, checks it once and hands you your prize: a single flower. Sounds ridiculous? 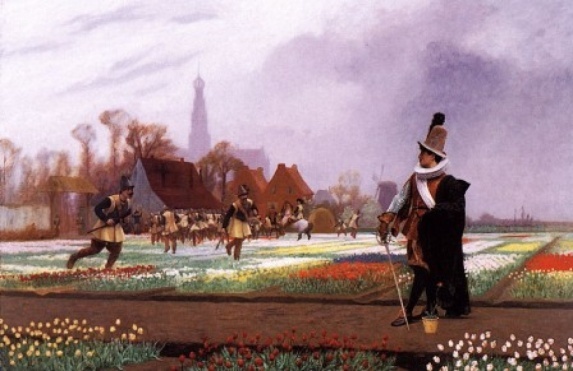 Welcome to Tulpenmanie “Tulip Mania”, the Dutch craze in the market for tulips during the 1630s. At its peak, single tulips were selling for more than a skilled artisan earned in a year. It could quite possibly be characterized as the biggest bull market in history. On the face of it, though, it sounds implausible. Why would anyone pay so much for a flower? No matter how good-looking or how fragrant it was, surely it wasn’t worth that much? Tulips couldn’t be used in cooking; they had no medicinal properties…so why were they being valued so highly? The answer is simple: bulls were running wild in the market. Fortunes were made and lost in hours. It could have even been the first time that the middle-class got involved in speculation, which was until then historically the domain of the idle, landed rich. Let’s go to the start of the story. Ogier de Busbecq, the Ambassador to the Sultanate of Turkey, came back bearing gifts that included some tulip seeds and bulbs, in 1554. People soon realized that the plants were hardy enough to survive in the Netherlands – and they looked quite beautiful, boasting a multitude of colors. Soon, people became taken with them and they started selling at relatively high prices – equal to, let’s say, a silver cup; but nothing absurd yet. Then the speculators – the bulls – came roaring in. Each of them fully expected the market price for tulips to rise further than it had, and placed contracts with the farmers, assuring them that they would buy their tulips at a higher price. Once this had been done – the same way the current stock market works – and even before they received the delivery of these tulips, they began selling these contracts to other bulls who expected the prices to rise further. These bulls, in turn, bought these contracts and tried to pass the tulips on to others who were even more optimistic about the future of the tulip market. This was then described as the ‘windhandel’ or ‘Wind Trade’ because no tulips were actually changing hands, only empty air. The price of tulips steadily rose in a never ending upward spiral. Everywhere you looked, from middle-aged men with steady jobs to rich widows with no market knowledge, everyone made a fortune from tulips. The bullish market simply kept climbing to absurd heights. 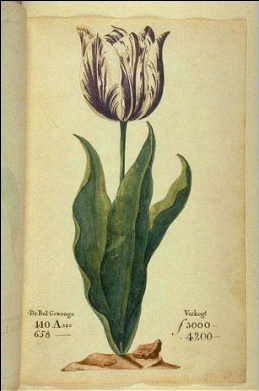 Rarer species of tulips were sold at comically absurd values – one such, called The Viceroy went for 4000 florins when a skilled master artisan made only 3000 florins annually. Tulips became the floral equivalent to gold. Amusing anecdotes abounded – an uneducated sailor accidentally ate a tulip bulb, mistaking it for an onion, and the merchant and his entire family chased after this hapless seaman, shivering in rage, and threw him into jail. This market reached its peak in 1637. People were so affluently wealthy by trading in tulips that a contemporary commentator who visited the area at the time remarked that the people didn’t seem to know ‘what poverty was’ – and all this even before the tulips planted had matured, as they eventually would in the summer of 1637. The effect of this historical Bull Run couldn’t last. Eventually, the tulips matured. They were ready to be physically sold. And then the realization that these were simple plants that could be used for no other purpose than to look pretty in a flowerpot sunk in. The first signs of the impending collapse manifested in people refusing to show up for a routine tulip auction in Haarlem, the kind that would normally have been packed to the rafters. The people who had finally ended up with the contracts found themselves unable to locate someone willing to buy it from them at a successively higher price than the preposterous heights it had already reached. Desperate, they refused to pay 3000-4000 florins for a single bulb. The farmers, understandably, were not pleased by this refusal to honour the contract, having fully expected to get rich. A long litigation process ensued, and finally the holders were ordered to pay the farmers 3.5% of the value listed as compensation for not being able to follow the terms set out. 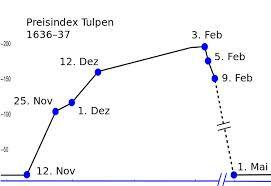 Looking back, Tulpenmanie basically codifies the patterns that have repeated in bull markets since – from the roaring 1920s market that collapsed to the Great Depression, or the dot-com bubble that eventually burst in the early 2000s. Although historians and economists contend about the details – some postulate that the effects were less widespread than generally believed – one thing is for certain: that there was a brief period in history where a single, somewhat attractive flower, was worth more than a house.